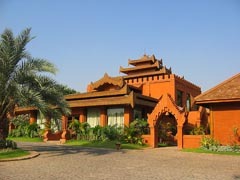 Treasure hotel at Bagan ( Burma Myanmar ). Rooms : 94 superior and 2 suites. Rooms are big, bathroom in white marble. It is very correct, not as good as the Tharabar Gate bedroom, but very good any way. Restaurant : International, Myanmar, Chinese. Comments : email baby sitting, pressing, spa. All the services of a good 3 stars hotel (opening in April 2005). © 2018 Ananda Travel Yangon. All rights reserved. E-mail : infos@ananda-travel.com. Write to : webmaster.